a feature that made it even easier to join a Google Calendar meeting using a CalDAV-based third-party calendaring client. We’ve heard from you that this functionality is helpful and you’d like to see it expanded to more calendaring clients. That’s why now, whenever someone uses G Suite Sync for Microsoft Outlook, Google Sync, or a third-party Android client that relies on Calendar Provider to access an event on Google Calendar, we’ll add automatically generated text to the event’s description. This text will include instructions on how to join the event through Meet or Hangouts. 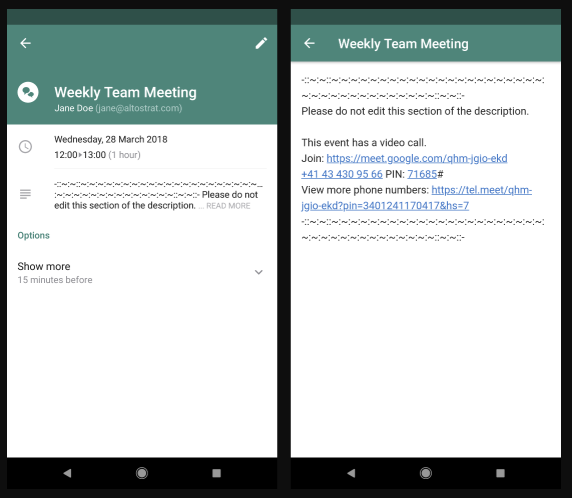 With this launch, people using Google Calendar clients that don’t display meeting instructions natively (e.g., Samsung S Planner) no longer need to go to Google Calendar on the web to join their meetings. In August 2017, we announced a feature that made it even easier to join a Google Calendar meeting using a CalDAV-based third-party calendaring client. We’ve heard from you that this functionality is helpful and you’d like to see it expanded to more calendaring clients. That’s why now, whenever someone uses G Suite Sync for Microsoft Outlook, Google Sync, or a third-party Android client that relies on Calendar Provider to access an event on Google Calendar, we’ll add automatically generated text to the event’s description. This text will include instructions on how to join the event through Meet or Hangouts.